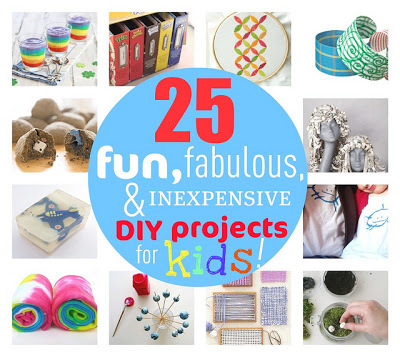 Here is a fantastic roundup on 25 Fun, Fabulous And Inexpensive DIY Projects For Kids.Take an afternoon and spend some wonderful and fun family time and make something today. Have a look through this list of great crafts as I am sure you will find something that will work perfectly for yourself and your children. Mix together sugar, salt and cornstarch in a small pan, then slowly add cold water. Cook over low heat, stirring until the mixture becomes a smooth; almost clear gel about 5 minutes. When it's cool, stir in clear dishwashing liquid. Scoop equal amounts of the mixture into containers and stir in food coloring or, for even more vibrant colors, use food-coloring paste.